National Solidarity Party (NSP) on Friday urged government to cap the growth of Singapore’s foreign workforce and focus instead on improving the fertility rate as a solution to the city-state’s population woes. Releasing its own population white paper, the opposition party criticised the government’s broad plan to allow Singapore’s current population of 5.3 million to rise to 6.9 million, of which nearly half would be foreigners, to ensure the country’s sustainable economic development. In a presentation of its paper Friday night, NSP Secretary General Hazel Poa batted for a “pause” in the growth of the country’s foreign workforce until productivity growth increases since “we are increasing the number of people faster that we able to increase the value of goods and services produced”. “The increase (in population) is to likely to further depress our fertility rate, creating a vicious cycle,” said NSP. NSP also pointed out that the growth in foreign labour did not match the growth in productivity thereby showing that it made little sense to continually embrace the foreign workers. 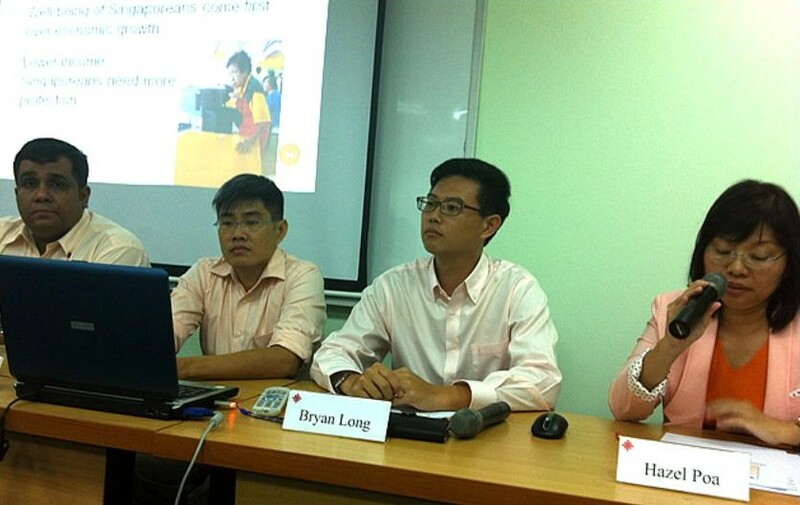 Plus, the influx of foreign workers has depressed wages for lower-income Singaporeans, the party said. Companies have to “offer better wages to attract workers or they have to improve their productivity,” she asserted, adding that infrastructure should also be built first to accommodate a larger number of people before allowing the population expansion. Meanwhile, NSP Head of Policy Tony Tan questioned the wisdom of having a denser population in Singapore as studies have shown that the regions with the highest population densities – such as Hong Kong, Macau and Singapore – also have the lowest fertility rates. The party also took issue with the argument that the declining number of working citizens to the support the elderly called for the entry of more people into the country now. Tan said that if Singapore welcomed foreign workers now, it “is going to exacerbate our old age support ratio” in 2030 when these workers themselves become part of the retired old age group. Instead of getting the foreign population to compensate Singapore’s dwindling workforce, promote more policies that would encourage families to have more children that would be part of future manpower, the NSP argued. In order to encourage Singaporeans to have bigger families, NSP member Bryan Long suggested tackling the high cost of bringing up more children by such measures as providing free upgrades to a larger HDB flats for those who have more children and removing resale levy for parents to move closer to their working children. Also, give families with more children priority for school, such as for Primary one school registration and free tertiary education for the third child onwards. Noting that the government’s baby bonus scheme has not stopped the slide in Singapore’s total fertility rate, Long suggested incentives like free delivery and hospitalisation for the third and subsequent child. The population white paper will be debated in Parliament next week.